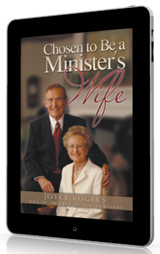 Rejoice with Joyce Rogers, wife of the legendary Dr. Adrian Rogers, as she shares her very personal experiences and Godly wisdom in Chosen To Be A Minister's Wife. 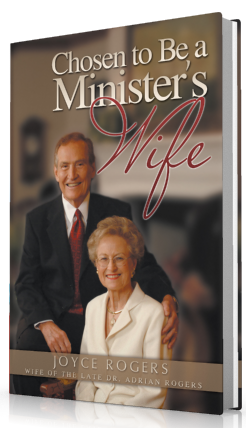 This personal journey, replete with stories, pictures and life lessons, is a must read for ministers and their wives--and for the next generation considering ministry service. Available in the US and Internationally Now! 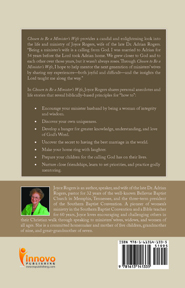 Joyce Rogers is an author, speaker, and wife of the late Dr. Adrian Rogers, pastor for 32 years of the well-known Bellevue Baptist Church in Memphis, Tennessee, and the three-term president of the Southern Baptist Convention. A pioneer of women's ministry in the Southern Baptist Convention and a Bible teacher for 60 years, Joyce loves encouraging and challenging others in their Christian walk through speaking to ministers' wives, widows, and women of all ages. She is a committed homemaker and mother of five children, grandmother of nine, and great-grandmother of seven. "Joyce Rogers has written a wonderful resource for pastors' wives that is practically useful, beautifully transparent, and personally intimate. Not only does she share practical wisdom about personal priorities, ministry marriages, and raising children in the eyes of the Lord and of the congregations we serve, but she also reminds us of our greatest resources in meeting every challenge through constantly staying in God's Word and in prayer. Even though I have already walked with my pastor-husband for 37 years, I found myself coming to my Lord in personal rededication with renewed faith and joy at those places in the book where I am invited by Joyce to hear her exhortation and to respond in commitment. I am sure that you will too!" "Joyce, this book has brought joy to my heart! I can relate in so many areas. I learned a lot." "This book is full of humor, practical wisdom, and great spiritual insight. The journey Joyce and Adrian shared through years of ministry is a story of an incredible love and commitment between a husband, a wife, and their Lord. I eagerly encourage all ministry wives to read this much-needed book!" 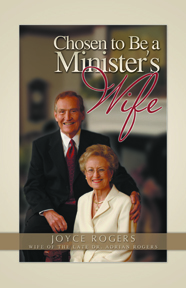 "Like Joyce Rogers, I became a pastor's wife at the age of 18. Through all the challenges, disappointments, struggles, and wonderful blessings, I have seen the hand of God, in both success and failure, allowing me to face each one with optimism, enthusiasm, confidence and faith. 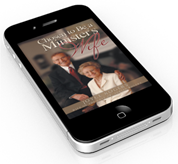 Chosen to Be a Minister's Wife is a practical guide that will encourage and inspire every pastor's wife for her journey in ministry with her preacher husband." "It was such a privilege and joy to read Chosen to Be a Minister's Wife. This book is not only informational, but inspirational and practical. Every minister's wife will benefit from the encouragement to discover and develop their uniqueness and also to realize the importance of studying and knowing God's Word. The book will be a constant resource for minister's wives as we continue the journey the Lord has called us to."